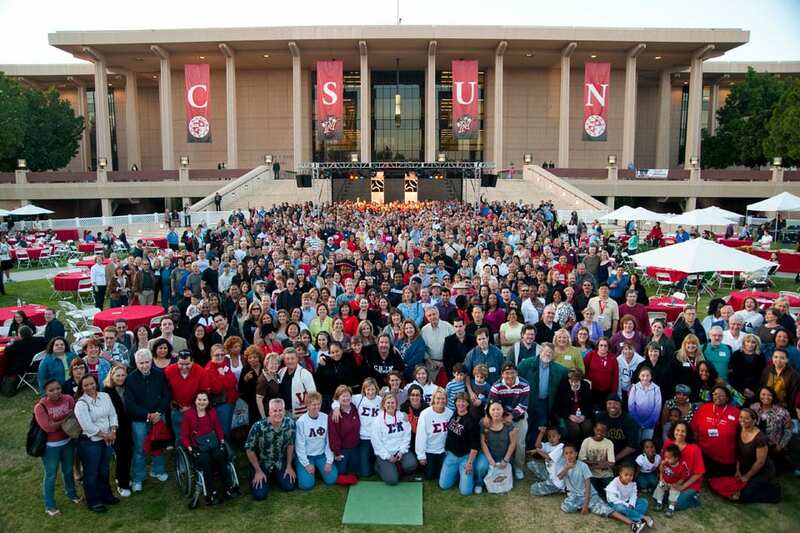 Thousands of alumni and friends of the university are expected for CSUN’s 60th Anniversary Grand Reunion on Saturday, Oct. 13. Thousands turned out 10 years ago for the 50th reunion, above. Photo by John Dubois. California State University, Northridge will mark its 60th anniversary by inviting alumni from across the decades to take part in a Grand Reunion celebration at the campus Oct. 14-16. The festivities include a picnic for thousands on the lawn of CSUN’s iconic Delmar T. Oviatt Library, a 5K run, an introduction to the defending Big West Conference Tournament champion women’s basketball team, a welcome to the men’s basketball team and new head coach Mark Gottfried, men’s and women’s soccer matches, and a special performance of the music of Henry Mancini at The Soraya. “It’s been a decade since we’ve held an alumni event of this magnitude,” said Shellie Hadvina, assistant vice president for alumni relations and annual giving. “All Matadors across all class years and all members of the community are invited to CSUN to reconnect with old friends and professors, explore the campus today and see firsthand how CSUN has grown into a leading university in the region and beyond,” Hadvina said. The celebration will begin on Friday, Oct. 12, with Matador Madness in the Matadome. Alumni and guests are invited to tip-off the basketball season with an introduction to the defending Big West Conference Tournament champion women’s team, and welcome a new era for the men’s teams with an introduction to Head Coach Mark Gottfried. Saturday, Oct. 13, is packed full of reunion activities, beginning at 9 a.m. with a 5K Matador Fun Run around the campus perimeter. From 1 to 3 p.m., the campus will host an invitation-only Founders’ Lunch and 50-Year Club Induction Ceremony for members of the Class of ’68 and faculty and staff who began their service to CSUN in 1968.